Satan would like for me to believe the lie that what I am doing doesn’t make a difference or that it is a failure so that I will quit doing it. However, I know that loving others is God’s will for not just me but for everyone. God will bless me for investing in the lives of those in my sphere of influence. Last week I shared how I felt that God empowered me with the Holy Spirit to complete my book/knitting projects. This past week I also had moment where I felt God filled me when I gave away one of my hand knit gifts. I was getting gas and while my tank was filling I decided to cash in my lottery cards that I had from Christmas. The clerk that waited on me had such a cheerful attitude and I felt God nudge me to give her one of my headbands that I had in my purse. It was cold and windy, so the perfect day to wear one. Despite my initial shock and apprehension, I took her hands and honestly have no idea what I prayed for her. I do know I thanked God for her joyful spirit, but other than that, what was said didn’t come from me. All I know is whatever words came out of my mouth, are what she needed to hear that day. After this as I was on my way to knitting, I heard on the radio that as Christians we need to let God’s Word live through us because that may be the only Bible someone hears. That was just a confirmation that I did exactly what God wanted me to do at that gas station a few minutes prior. As if that wasn’t enough, then I hear the song, Only Jesus and the lyrics that resonated with me were, And I, I’ve only got one life to live I’ll let every second point to Him, Only Jesus. At yesterday’s church sermon, the pastor said, “God will create the right atmosphere to love someone that needs to be loved.” I have no doubt that God created that situation at the gas station last week to speak through me. Where can you be bolder in sharing God’s love to those you come in contact with on a daily basis? Do you believe your kindness can change the trajectory of someone’s day? What can you do to live a life that points others to Jesus? If you knit or crochet, you have an opportunity to make a gift to give away this week. If you do, I’d love for you to share with me how it affected you. While my situation with the clerk was definitely out of my comfort zone, I don’t regret doing it. In fact, the only regrets I have had with my gift giving is when I feel like I should have blessed someone with one and I didn’t. Give me a heart to care about the spiritual welfare of those around me. I know that staying in Your Word is what will continue to equip me and give me to courage to speak and act out Your love to others through both my hands and heart. I thank You for giving me opportunities to share the hope of Jesus to those that need to hear it. I praise You for giving me the ability to do Kingdom work for You. It is in the name of Jesus, that I pray these things. Amen. 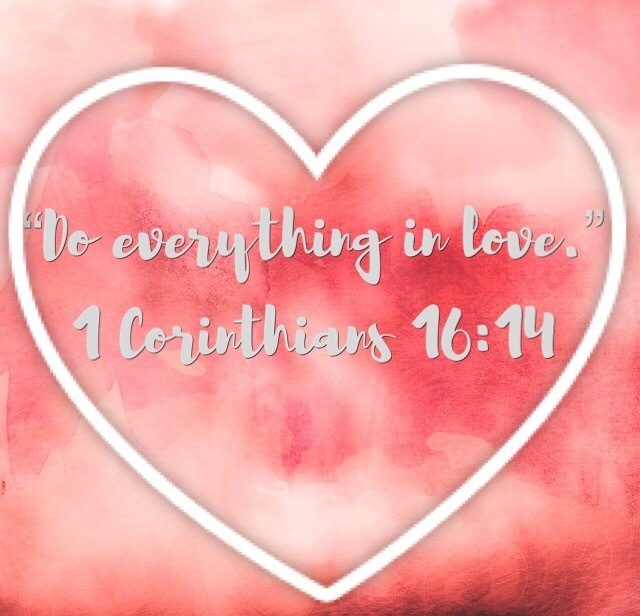 When I hear the word, “February,” I can’t help but think of hearts and Valentine’s Day. Friday is February 1st so I thought this Scripture was an appropriate one to engrave on my heart.